The Sani-Tech Systems Inc. Rotary Bottle Buster combined with the Sani-Tech Auger Compactor offers service that no other piece of equipment can. The system will remove liquid from a variety of containers (Aluminaum cans, HDPE, 16 oz Plastic, 2 L Plastic, etc.) and compact the shredded end product. 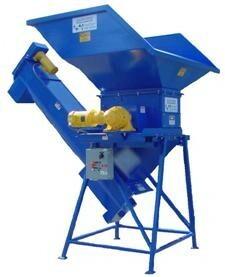 The system is completely hands-free once the material is fed into the hopper. If you need to remove liquid from off-spec, old, or damaged product, this equipment is ideal. Fast: The Bottle Buster will process material as fast as it can be thrown in. It can process 200-300 HDPE containers per minute and 1600-2400 16 oz PET container per minute. The Auger Compactor will process material 5 times faster that traditional compactors becuase it has no cylce time. It is continuously moving product forward. Clean: The system is completely sealed to prevent liquid and material spillage. Drain systems on the Bottle Buster and Compactor are used to reclaim liquid or send it to waste. Flushing sytems keep screens and drain systems clear. The container (10-47 yard) can also be equipped with floor drains to remove any remaining fluid. Reclaimation: The Auger Compactor can be equipped with custom drain systems and filters to reclaim fluid. If used with a compaction container, a drain system on the container will allow any fluid to drain. Versatile: The Rotary Bottle Buster can process a wide variety of containers without adjustment. It is available in 5, 10, and 15 HP and 24" or 36" drum sizes. The Bottle Buster can be installed on several sizes of Auger Compactors. Sani-Tech Systems can customize the feed system to be Thru-Wall, Forklift Fed, Auto Dumpers, Hand-Fed or Conveyor Fed. Quiet & Dependable: All electric drive systems are simple and reliable. No hydraulic systems, lines, leaks, filters, or reserviours to maintain. Valuable: The Rotary Bottle Buster and Auger Compactor substantially reduces labor and hauling costs related to product destruction or reclaimation. The system does not require baling, storing, tying or handling the material again once it is fed into the machine. The roll-off container is taken directly to the recycler. 100% Liquid Tight System, Heavy Duty Construction, Abrasion Resistant Steel Housing, All Electric Drive System, Heavy Duty Long-Life Bearings, "Almond" Machinery Enamel Finish, Easy Maintenance Design. Wall Chutes, Auger Compactor, Screw Conveyor, 5, 10, 15 HP Options, Custom Wiring to Conveyor Systems, Variety of Hooper Feeds Available, Custom Colors, Odor / Insect Control, Photo Eye Start Switch.